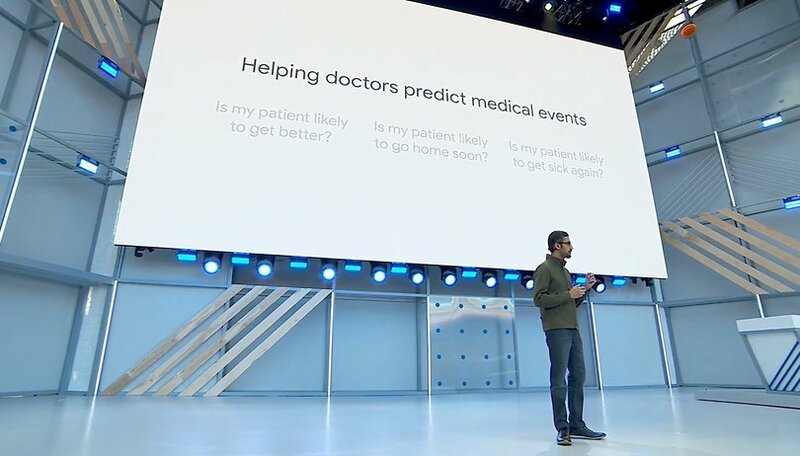 Google started its Google I/O with an important theme to grab the crowd's attention from the start: its role in healthcare. Google wants to show that it wants to help everyone, a great cause. Does Google really care so much? Google announced years ago that it was working on projects other than its apps, search engine, Android and many other topics. Most of these projects are unknown but Google began this year's Google I/O by reminding everyone about another thing it's working on: medicine. Thanks to the huge technological potential and tools at their disposal, Google is contributing to progress in healthcare to help users. Sundar Pichai, the CEO of Google, expressed the importance of technology to help people and improve their daily lives. Following on from the funny introduction about the burger emoji, he quickly moves on to a big theme in technology this year, Artificial Intelligence: "It is clear that technology can have a positive impact". Although at first it seems rather limited, it represents the future in many areas of medicine. Artificial Intelligence can succeed in areas where there is often a lot of human error, to help doctors make the correct decisions. For example, the importance of retinal scanning and the role it can play in predicting cardiovascular risk. AI does a much better job at noticing the signs, whereas the human eye would not be able to detect them. This is looking very promising. That said, it raises several questions. What if doctors are eventually replaced by machines? Surely this would never happen, and those working on these kind of technologies say that it would only be in addition to them, and never as a replacement. But, we're thinking way into the future here. There's no point in worrying too much right now, but it is worthwhile to make sure that technology is being developed in a responsible way. From another perspective, it's ironic that such a large company which collects data from everyone (not always for the greater good) now wants to help people. Improving the lives of patients is of course a commendable move for Google, but it will be interesting to see what it expects in return for this. Google is sticking its nose in many different areas, and it doesn't look like its going to stop. What do you think of Google's developments in healthcare and AI?